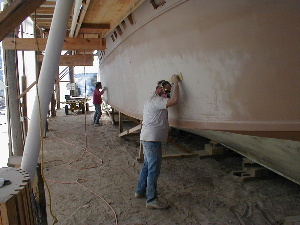 February 28, 2002 “The Cherokee used to thud,” reflected Tom Kirmeyer, knocking on the hull, “but now she rings.” The mystery is how Tom could hear anything over all the sanding that is going on – board sanding is all the rage at the Cherokee site, as the crew tackles the hull. Jeanette, Bud, Jim, and Stuart are applying elbow grease and working themselves from the starboard to the port side and back again. 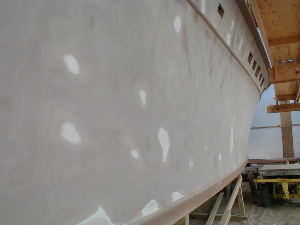 The hull will then be sprayed with faring compound again, and the sanding process repeated before the big paint job. 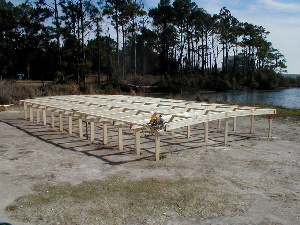 Meanwhile, Leonard and Bill Davis have finished sanding the deck, which is ready for box placement and teaking. 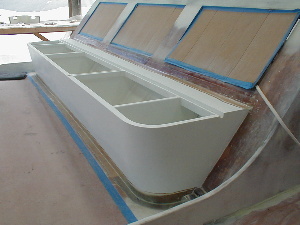 The toe rails and forward deck box are now installed permanently. 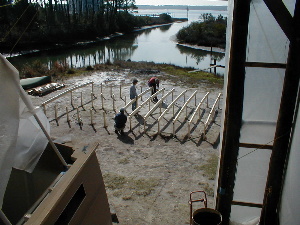 Spotter pilots above must have wondered what strange kind of structure was taking shape in the boat yard below. A garbage scow? A skateboard park? 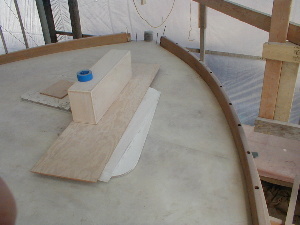 No – the crew has been constructing a jig for the cabin roof. 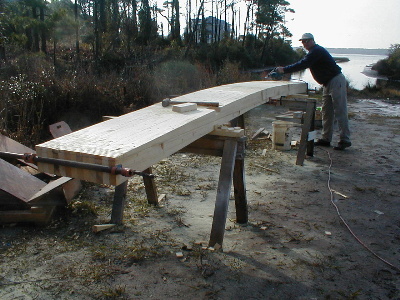 Leonard is shown below faring up beams for the jig, which the crew fit into a framework. 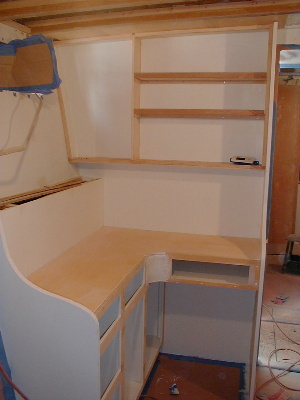 Interior work is rolling right along, with Tom Parker building drawers for the stateroom vanities and head cabinets – Stuart and crew just finished painting the drawers. 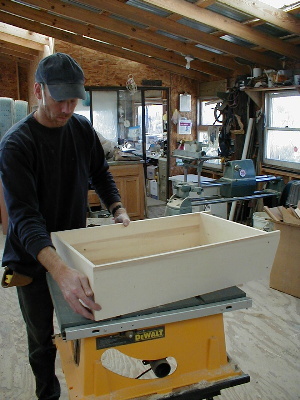 Tom Kirmeyer continues to making adjustments in the equipment room, and Norm is sanding the steps to the master stateroom and guestroom area in preparation of…you guessed it – paint. 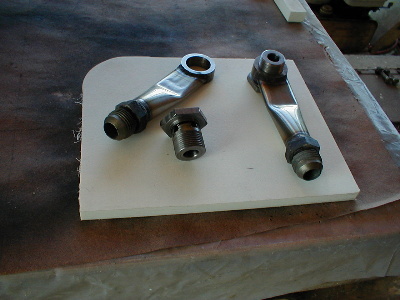 Bill Brown is excited about the engine lube-oil drain adaptors that he designed and Fred Lindow manufactured. 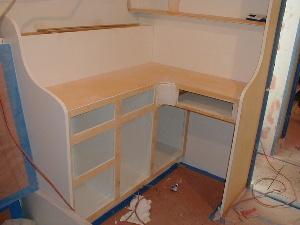 The tight clearance in the engine room required this customized work. 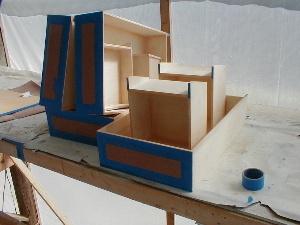 “Cool, aren’t they?” he says, placing them on a display board befitting the shopping channel. 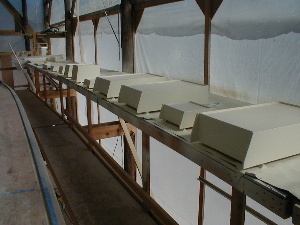 The drain adapters will be used for the 100-hour maintenance oil changes. Bill has also been testing the acoustics of the vessel, producing 54 hertz soundwaves from the engine room that put tiny ripples in everyone’s coffee.